07/26/2018 Oded is playing in a new Israeli TV series called "When Heroes Fly"
5/14/2016 Oded will host the Yummie Top Chef Awards Culinary Competition at Casa Pacifica. 7/15/2015 new web series "Hollywood Hitmen" will start Juiy 23rd. 7/15/2015 Don't miss Oded in Stitchers! 8/14/2012 Oded Fehr will guest-star in the Covert Affairs episode airing TONIGHT titled 3.05 This Is Not America. 5/15/2012 Official Trailer "For the Love of Money"
2/18/2012 Oded Fehr guest starred in "Jane by Design"
11/23/2011 Happy Birthday Oded! Have a great one! 6/20/2011 Oded was on Covert Affairs: Good Advice - Promo video. 1/9/2011 The second season of V started airing last week and Oded will be in 3 episodes: "The ranks of the Fifth Column will be expanded. Oded Fehr will join the cast for a three-episode stint as a member of a radical Fifth Column cell." But so far, we don't know yet which episodes this will be. 12/11/2010 Dear Rhonda and Oded, Congratulations on the birth of your baby girl, Azelie! Wishing you all the best and a wonderful time with your kids! There's no official confirmation, but some photos indicate that Azelie was born this summer, maybe late in July? 11/23/2010 HAPPY BIRTHDAY ODED!! Have a great day and may all your dreams come true! 11/9/2010 Oded joins the cast for the movie "For the Love of Money". Oded Fehr plays Manto in the episode 1.01 Hollywood. 9/24/2010 Actor Oded Fehr has joined the 'V' cast playing a radical Fifth Columnist named Eli Cohn. Erica Evans's Fifth Column cell will have to decide whether or not to join with him or take him down for being too extreme. Erica and Eli also share a mysterious, dark secret. 8/16/2010 Just got confirmation that Oded Fehr is no longer with Rain Management but is represented by Ilene Feldman Agency (IFA) again. 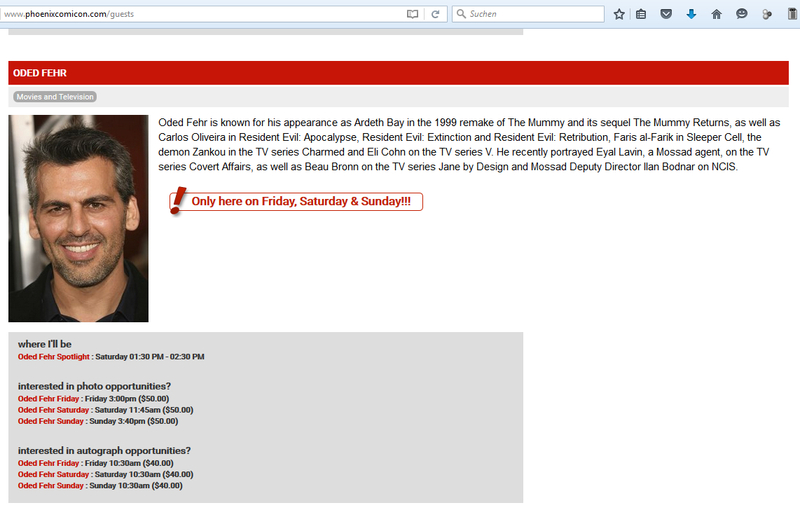 7/26/2010 Covert Affairs: Oded will be on the 4th episode called "No Quarter"